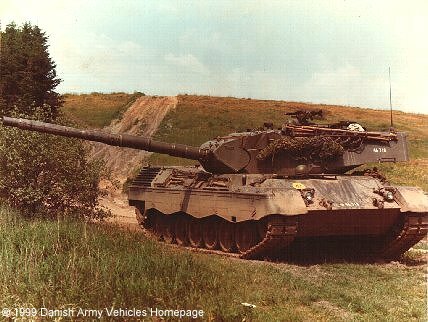 Danish Army Specific: Denmark procured 120 Leopard 1A3 MBT´s in June 1974 with first delivery February 24th 1976 and the last to be delivered in August 1978. Value of this order was 518 mill. DKr. The Danish Leopards were very similar to the German A3 with the exception of a periscope wipe system, and the deletion of the round close-defence weapon blanking plate on the top turret. Also the turret was prepared during manufacture for a integrated fire-control system. All were fitted dozer attachment channels on the lower front hull. Normally one tank in each platoon is permanently fitted with a dozer blade. When in use the headlights have to be re-located on the dozers actuation box. This lead to to the retirement of the Centurion MBT, and the swap from M41 DK-1 to Leopard MBT´s in the reconnaissance squadrons. All 230 units have been brought up to Leopard 1A5 DK standard by Falck Schmidt, Odense and Wegmann, Kassel (turret) from 1990 - 1994. With the Defence Agreement 2005 - 2009 made in 2004, it was decided that the Leopard 1 MBT no longer would be a part of the inventory of the Danish Army, and it lost operational status in 2005. Historical: The development of the Leopard 1 originates from the decision to replace the M47 and M48 tanks delivered to the German Bundeswehr by the Unites States. The operational requirement was finalised in 1957, and the design programme commenced with France and Germany signing an agreement to develop a common tank. The 2 countries were joined by Italy in 1958. The first prototype vehicle was ready in 1961. 50 prototypes were ordered for trials and produced by MaK, Luther & Jordan and Jung-Jugenthal. After trials France left the programme in 1965 and carried out the development of their AMX-30 tank. Italy decided to go for the American M60 tank. The Leopard 1, based on a design by Porsche, was first produced in 1965 by Krauss-Maffei AG for the German Ministry of Defence. The initially full-scale production run included 1.500 tanks. The Leopard 1 was produced in six batches ("Lots"), and Krupp MaK in Kiel became co-producer. A modernisation programme was started in 1970 in order to improve the fore control system, full stabilisation and thermal sleeve for the gun, side-skirts new tracks a new snorkel and passive night image intensification. The designation was now Leopard 1 A1. The development continued up to A5-level, which included a new fire control system, new ammunition and a strengthened torsion bar suspension system. More than 4.700 units have been delivered to Australia (90), Belgium (334), Brazil, Canada (114), Chile, Denmark, Germany (2.437), Greece (106), Italy (920), the Netherlands (468), Norway (78), Turkey (77) and others. Production ceased in late 1979, but was reopened to meet new orders from Greece and Turkey. Also produced by OTO Melara in Italy for the Italian Army. Length: 9.54 m (372 inches (including main armament)). Width: 3.25 m (126 inches). Height: 2.64 m (103 inches). Weight: 42.400 kg (93.280 lb.). Armour: 25 - 70 mm (1.1 - 2.8 inches). Engine: V10-cylinder MTU MB 838 Ca M500, 37.400 cm3 (2.281 cubic inches), liquid cooled. Horsepower: 830 hp at 2.200 rpm. Transmission: 4-speed ZF Hydromedia 4 HP 250 gearbox with torque converter. without preparation: 2.25 m (88 inches). with deep water fording kit: 4.0 m (156 inches). Fuel capacity: 980 liter (215 gallons). Range: 600 km (373 miles). Armament: Armed with a 105 mm gun (L7A3 by Royal Ordnance in Nottingham) and 2 7.62 mm machine-guns. 55 rounds of 105 mm ammunition is carried, 13 in the turret and 42 in the hull. 4 smoke dischargers on each side of the turret. Additional: Standard equipment includes B171 II night vision devices, EMES12A1 laser range finder, NBC-system and a crew heater. All Danish Leopard 1 were fitted with a dozer attachment channels on the lower front hull from the factory, and thus can be fitted with a dozer blade from Krauss-Maffei-Wegmann. The dozer blade can be attached or removed in approx. 10 minutes and can be locked in the raised position for travelling. All control elements are packaged into a watertight unit, so that the dozer blade can be used during fording operations. - Leopard 1A3 Drivers Training Vehicle (6 ea.) (20 kb).